Spain’s Capital is awash with bars & restaurants but how to choose the right place without falling into a tourist trap? The answer is here. Every time I fly into Spain is hard to describe the way I feel. The excitement runs through my veins and the first word that comes into my mind is Tapas. 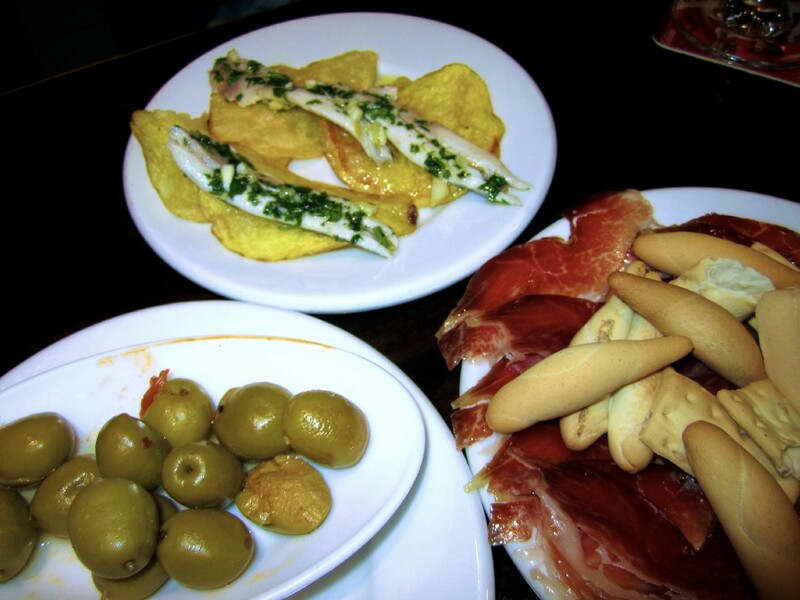 I am 100% sure you have heard this word so many times… but what the word Tapas really means? 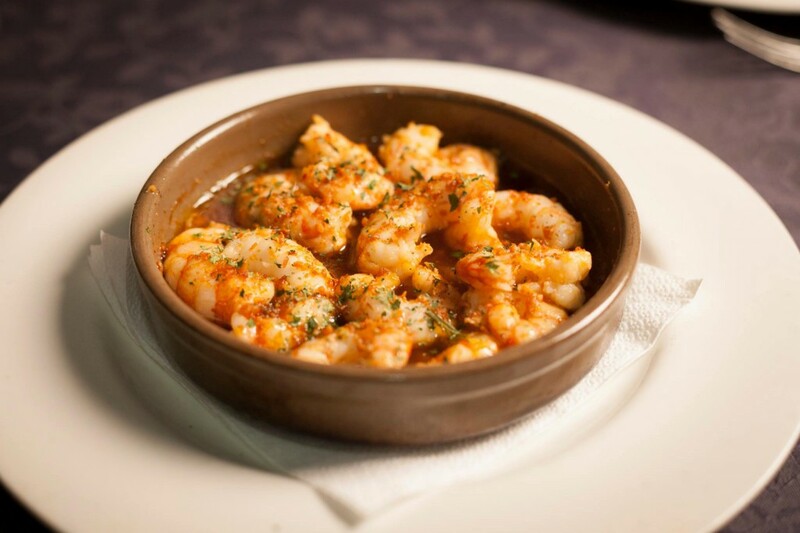 According to the Oxford Dictionary is a small Spanish savoury dish, typically served with drinks at a bar. Its origin comes from Spanish tapa, literally ‘cover, lid’ (because the dishes were given free with the drink, served on a dish balanced on, therefore ‘covering’, the glass). The legend tells that in order to keep insects and dirt out of their drink, the Spanish would cover or “tapar” — Spanish verb which means to cover — , their drinks with a piece of bread. Spain is synonymous with good food, good weather and of course good people: three pillars in life (all you need to survive!). 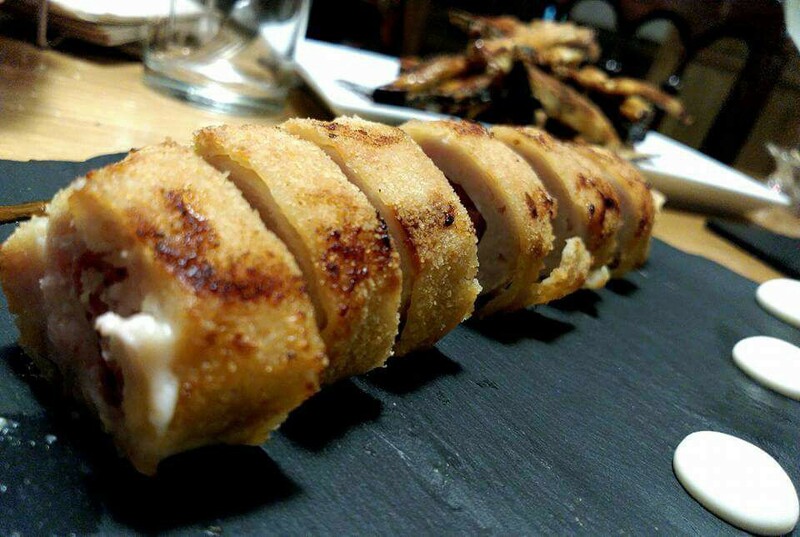 The wide variety of different type of tapas that Madrid has to offer to its people is endless…and of course delicious. Over the time, tapas’s evolution has been terrific. These little gems have changed for the better and have come a long way from being a free nibble with a drink. Luckily, nowadays, we can find select bars in Spain and find out that these bite-sized Spanish treats have obviously evolved into a more sophisticated cuisine. Is more than obvious that this evolution comes from the country’s heritage through the incorporation of new ingredients and influences from different cultures. Loved by tourists and its people, Madrid has it all. This busy Spanish capital is more than a Metropolitan city, is a clear example of good taste when it comes to enjoying good food. In every corner, you’ll find a place to enjoy Spanish dishes and mingle with the locals, which is always a good craic, 100% guaranteed! However, the question is where to go exactly? 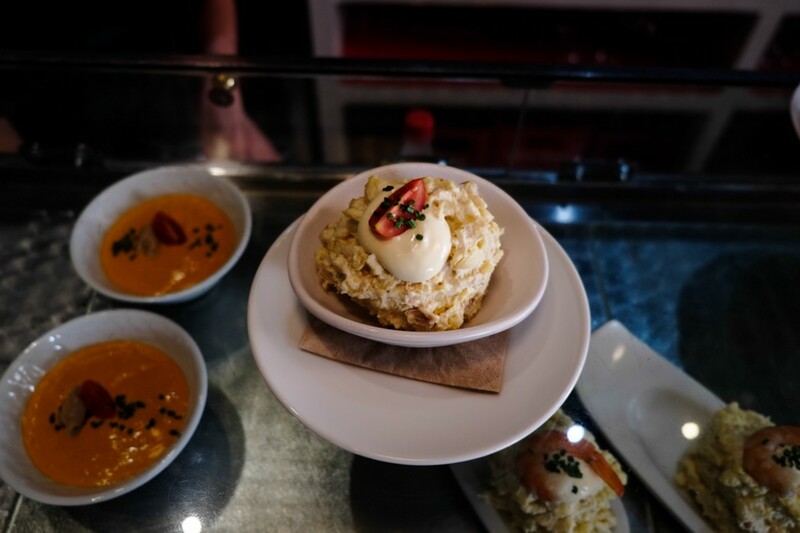 The list could be endless if you know Madrid by heart but if you don’t, just follow my culinary route with this Top 3 Best Tapas Bars in Madrid. One Route but only 3 Mandatory Stops! If you are a big fan of Andalusia and its culture and you want to try typical Andalusian dishes this is the place then! 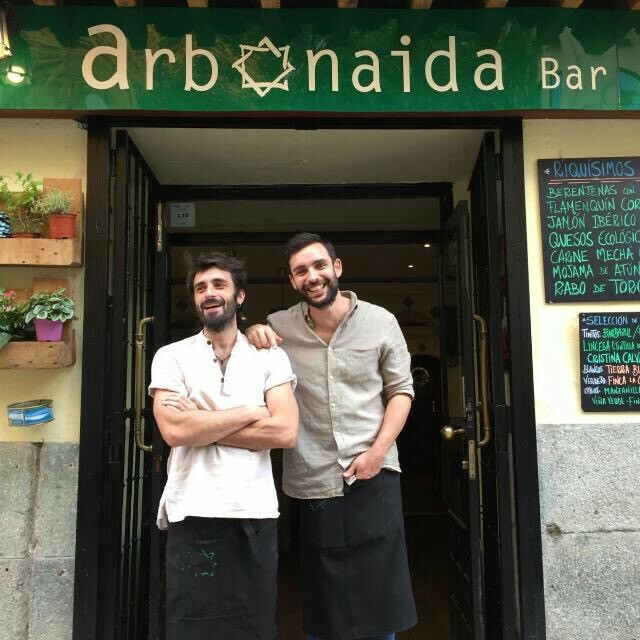 This new hidden gem in the center of Madrid— very close to Opera metro — has opened to the public in February 2016 and it is run by two best friends and front-of-house managers: Sergio and Jóse. Decorated with a unique Andalusian touch, this new spot in the heart of Madrid offers a great atmosphere and it is mostly frequented by locals. Eating with the locals in small restaurants off the beaten track is the best way to soak up the local culture…and this place is a perfect example. What Arbonaida means? People from Andalusia refer to the Andalusian flag as “Arbonaida”, which means “white and green” in Mozarabic language. What I love about this new place is the wide range of options you’ll find on the menu! Arbonaida offers a good selection of homemade dishes at a very reasonable price. If you are vegetarian, you will also find multiple yummy options to choose from as well! So no one is excluded here. Now, let’s go to my favourite part of all… the menu! Everything is delicious, healthy and homemade…and guess what? Vegetables come from organic farms!!! You can’t get any healthier than this! Don’t miss a traditional dish from Córdoba, Flamenquín Cordobés (rolled pork loin stuffed with cheese, cured ham and deep-fried). To die for! Another typical Andalusian dish to try — especially on summer days — is the famous Salmorejo! This refreshing and creamy soup is originating also from Córdoba (of course, where else?!). It is made from fresh tomatoes, bread, oil, garlic and a bit of vinegar (so is a purée consisting of tomato and bread). This dish is served cold…yes! This is not hot like most of the soups. It may be garnished with diced Spanish Serrano ham and diced boiled eggs. Salmorejo is similar to the typical Andalusian gazpacho soup but more pink-orange in appearance and also much thicker and creamier in texture, as it has more bread. If you like fish so then you have to try this typical dish from Gadir, now Cadiz: Mojama de atún con Almendras (cured tuna with almonds). 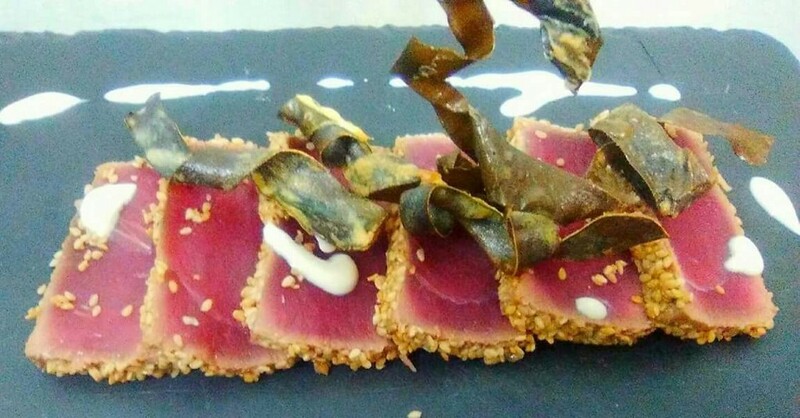 It is a Mediterranean speciality consisting of filleted salt-cured tuna. If we go back in time, we’ll find out that the word mojama comes from the Arabic musama (dry). This delicacy is usually served in thin slices with olive oil and chopped tomatoes or almonds. In Madrid, mojama is a very popular tapa served with a short beer and olives. 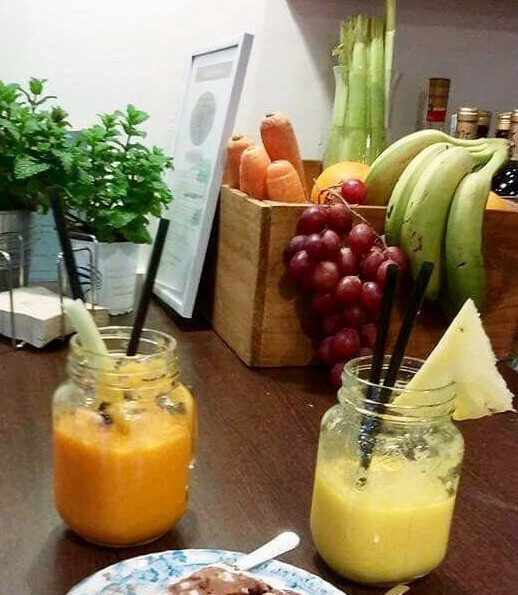 If you’re a big fan of Batidos de Fruta (smoothies), then don’t leave this place without trying at least one! These smoothies are super healthy and are made with fresh fruit…and, of course, loving care! They come in a huge glass, which is big enough for one! I am addicted to these two: orange, carrot and celery & pineapple, ginger and mint. If you are heading to Madrid this summer so this the best refreshing option for Spanish hot days! In addition, if you are addicted to desserts (like me!) this amazing place offers homemade cakes like Tarta de Cacao y Cerveza Negra (cacao and stout cake) and my favourite one so far (because I am addicted to this Argentinian caramel sauce) Tarta de Banana y Dulce de Leche (banana and caramel cake — similar to Banoffee Pie). 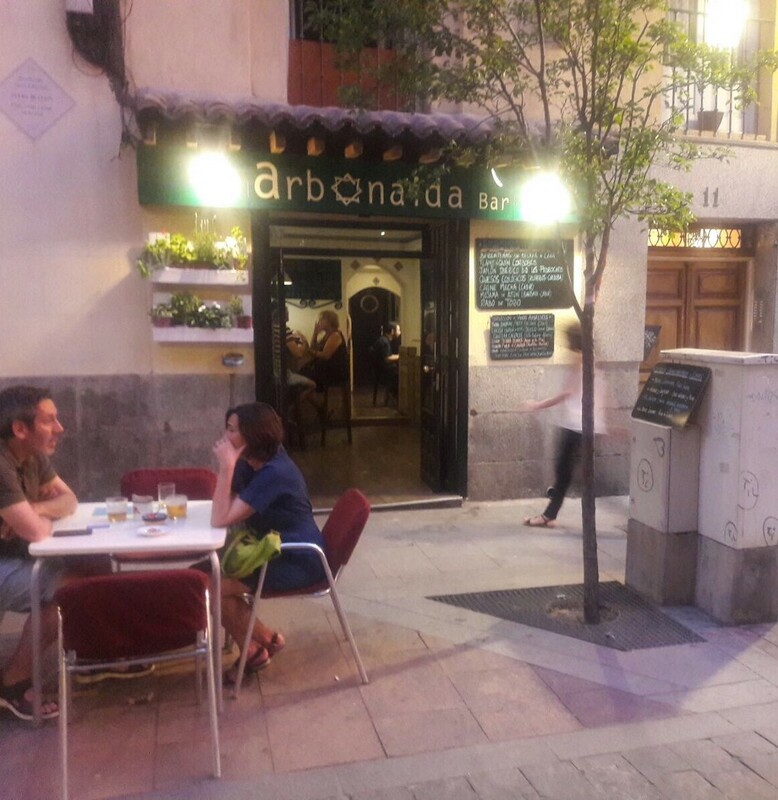 If you want to feel like a local and soak in the Spanish culture, Arbonaida will not let you down at all. 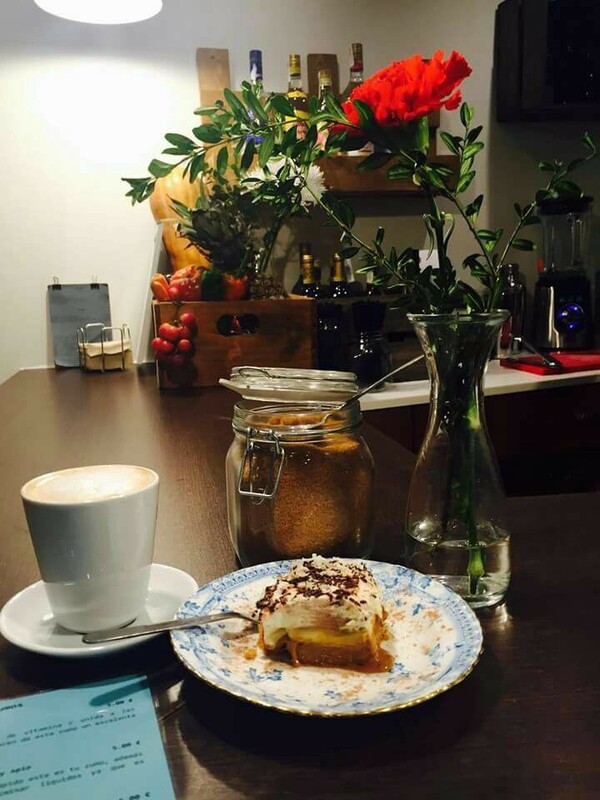 English menu is also available and excellent prices with dishes that will fill you up! Fast and friendly service is also included in the price… what else do you need? You have it all! Well done Sergio and Jóse, keep up the hard work! This place offers two branches located in the heart of Madrid. One is super close to Opera metro and the other one close to Alonso Cano metro. 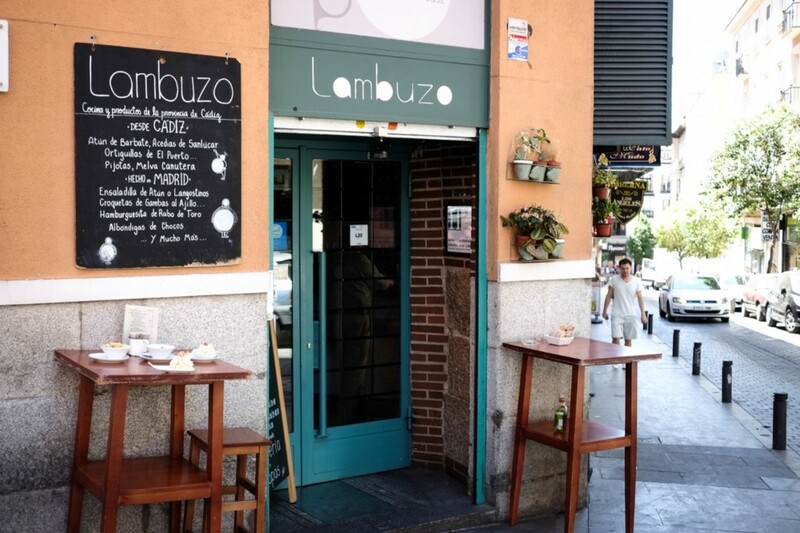 Lambuzo is one of my favourites spots in Madrid. Why? Just because great atmosphere and yummy food is always a good combination and this place is not an exception! Dishes are inspired by traditional southern recipes — from the one and only Andalusian region — but to be more precise from Cádiz. 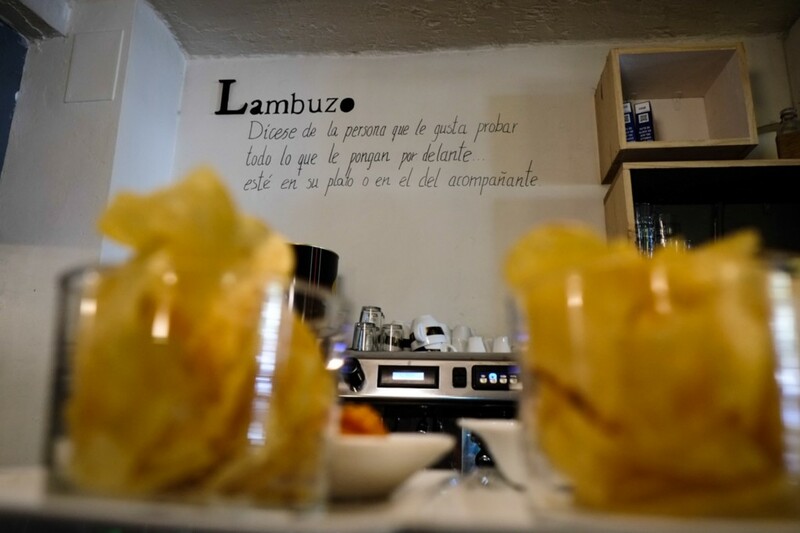 Lambuzo, which symbolizes the soul and spirit of Andalusian roots, has opened to the public in 2013 and since then it hasn’t stopped succeeding and adding loyal customers on their list. Now a new branch is opened in Chamberí, also in Madrid City. Why is this place called Lambuzo? Spanish adjective that describes a person who loves eating any kind of food…but not only from his/her plate but also from the companion. Now, ladies & gentlemen, let’s get to the point: the menu. 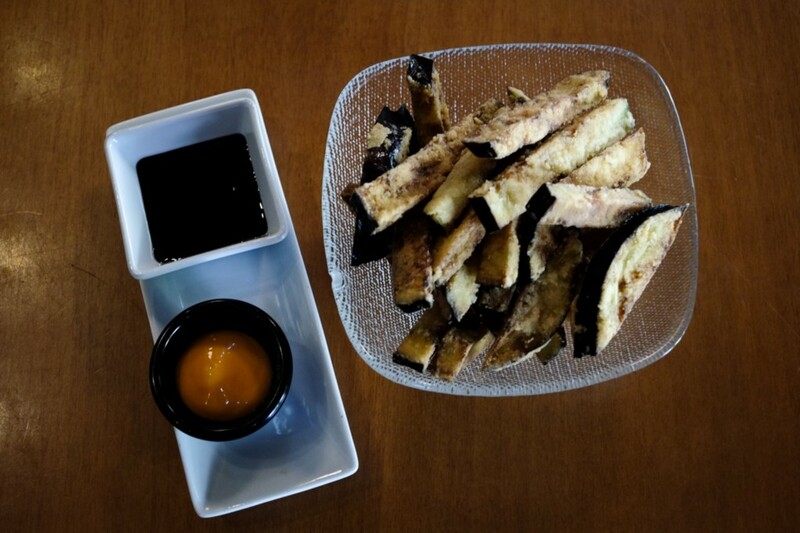 Lambuzo offers a flexible menu to all kind of tastes, offering different type of tapas and half/full portions. You’ll find so many mouth-watering options! Such as different type of fried fish like Boquerones al limón (anchovies with lemon), outstanding Croquetas filled with garlic shrimp or shrimp omelet (small rounded mass consisting usually of minced meat, fish, or vegetable coated with egg and breadcrumbs and deep-fried). Don’t miss cold starters such as Ensaladilla con Atún de Barbate (potato salad with tuna from Barbate, Cadiz — my favourite in whole Spain!) 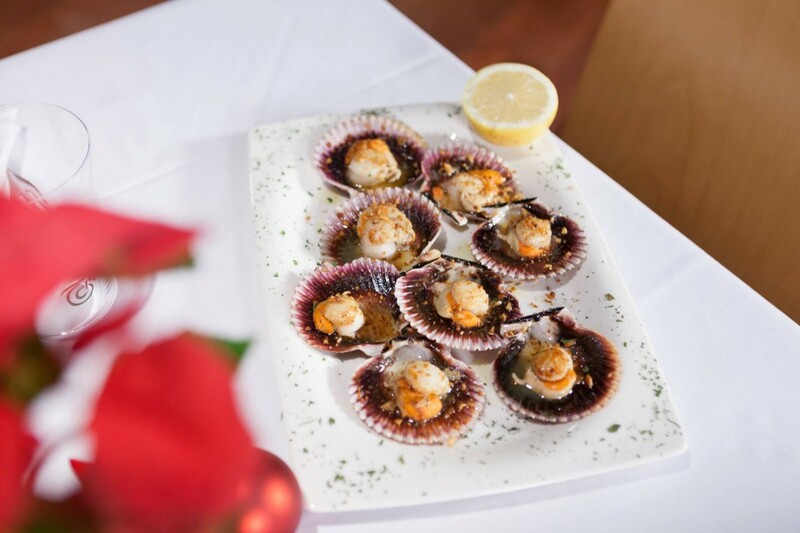 — , the one and only Andalusian Berenjenas con salmorejo o miel de caña (deep-fried aubergine with salmorejo or honey) and more filling dishes like Albóndigas de Chocos (cuttlefish meatballs). Lambuzo offers an affordable weekly lunch menu, and for those who look at the dessert section first (like me! ), this place offers one of the best homemade Tarta de Queso in town (cheesecake, baby)! Apart from tasty and yummy food, you’ll find the owners’ personal selection of food products (from the south of Spain, of course!) which are available for sale at the bar. 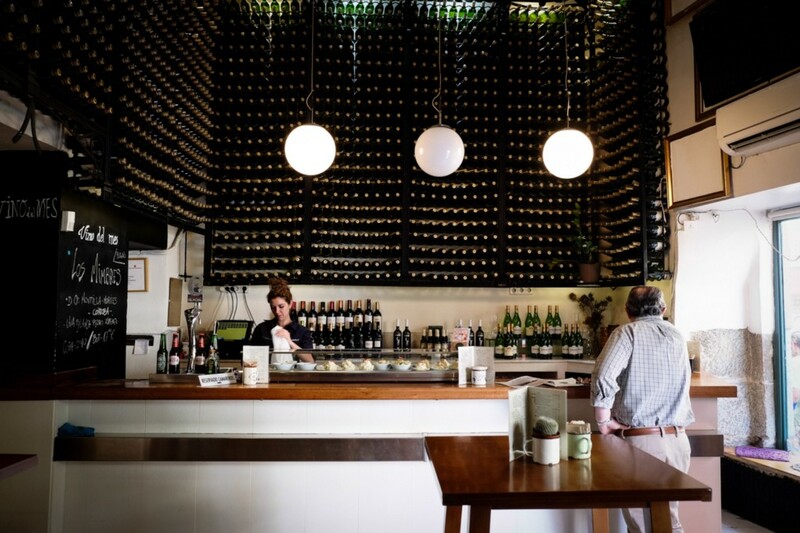 Wine lovers will also have the chance to enjoy a great selection of tasty vino! If you are looking for a welcoming spot with a bit of Cádiz in it, Lambuzo is the chosen one! English menu available and everything is reasonably priced. Great and fast service. Not to be missed! 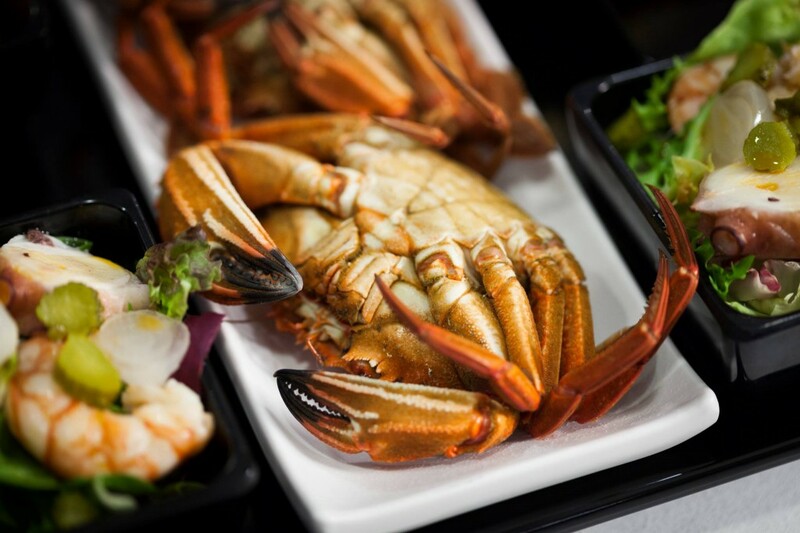 Are you a seafood & cider lover? So this is the place! This outstanding restaurant offers two branches to choose from. The one in Paseo de La Castellana is easy to get by public transport or by foot. 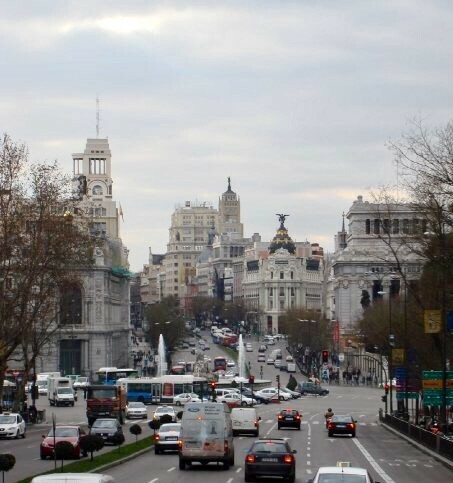 The other one is in the heart of Madrid and super close to Plaza España and metro station (Plaza España). Marisquerias La Chalana offers to the public beautiful food and excellent service. This place will meet and surpass all expectations. Keep in mind that due to the high quality of food and amazing prices that this place offers, Marisquerias La Chalana is always full. 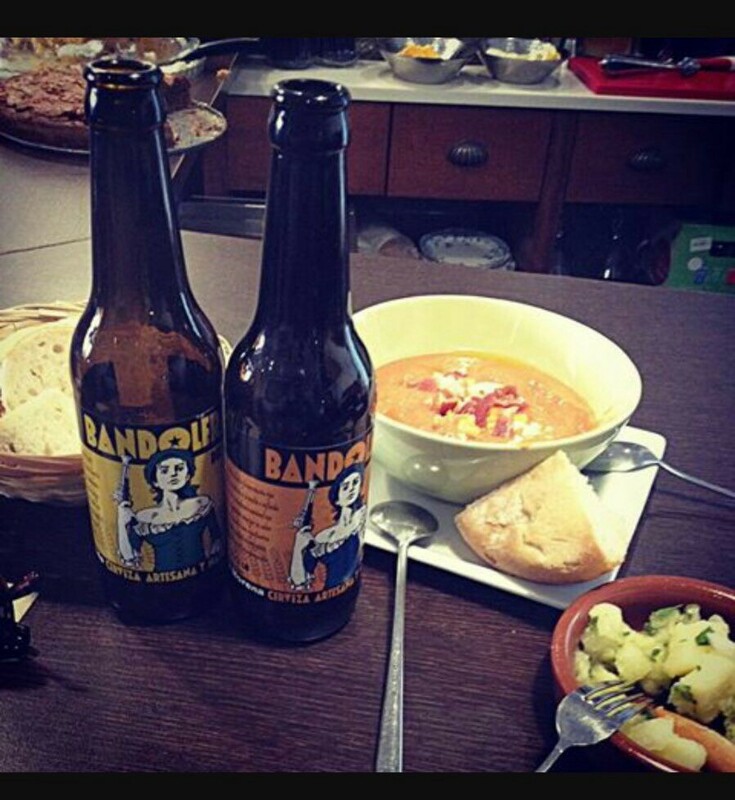 If you like you can sit on a table (we still advise you to book in advance) or you can “tapear” at the “barra” (counter in a bar). I remember being there once with a friend and the bar was packed full of happy people eating lovely food. We were lucky to squeeze our way in and as soon as we got to the bar, there was a big selection of everything but what was appealing to me was the fresh seafood displayed. Now let’s talk about the menu. If you are a big fan of fish, you’ll have a very wide range to choose for. I love this place because it offers big and generous portions! Massive portions to share! For example, if you are a big group you have to go for Chalanón de Mariscos (large sharing seafood platter) that comes with one lobster, one king-crab, one brown crab, crabs, shrimp and crayfish and three sauces. It won’t let you down for sure. The seafood menu is unbelievable massive. For those who prefer meat, they will be able to enjoy dishes such as Solomillo a la Parrilla (grilled sirloin steak) and Entrecot al Cabrales (sirloin with “cabrales” cheese — blue cheese made by rural dairy farmers in Asturias, north of Spain). If you like rice you have to try Arroz con Bogavante (lobster rice) and Arroz con Almejas (clam rice). If you want to be up today with the deals that this terrific restaurant shares on social media channels, don’t forget to check out their Facebook page! They are all the time posting offers on food + drinks. If you are a cider lover, you will have the chance to try typical cider from Asturias! My favourite deal is the massive tapa (sorry, H-U-G-E tapa!) of fresh grilled prawns you can get at the bar if you get six culines (jigger) of cider. The price? Only 6 euros! As you can see, prices in this place are unbelievable cheap for the quality of the food offered! So if you are a fish lover this visit in a must! MadriZ ….you did it again.